The 600mm and 950mm stone mills manufactured by ABC Hansen with stainless steel contact parts, are very well suited for rye flour and buckwheat flour mills as well as barley and rye and quinoa flours. The exact same equipment, in some cases only screen changes are necessary, can be used for milling all these grains including wheat. A specialised miller can therefore create a large turnover from these various relatively niche market flours. This is also ideal for the larger baker wishing to integrate his business vertically. Rye may be milled after having undergone dry polishing with the ABC Hansen polisher, to reduce on bran content in the flour. 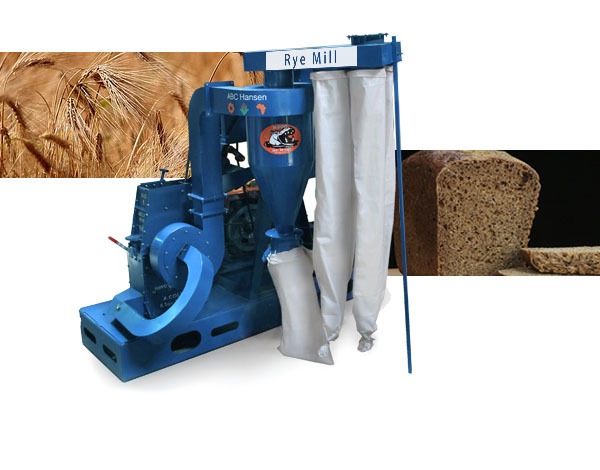 The rye may also be milled after dampening and conditioning followed either by polishing (in this case the bran would separate easier and in larger flakes from the endosperm in the polisher) or by milling direct in the stone mill and then sifting the bran from the flour in a rotary sifter. (The rotary sifter is also available from ABC Hansen). The bran always mills more difficult than the endosperm, resulting in its being able to be screened off in a sifter. Whether the rye kernels are conditioned and milled straight or whether the rye kernels are first polished, it is still recommended that the flour be sifted before packing. Rye flour can be mixed with wheat flour, barley flour and oats flour to produce a 4 grain loaves or other bakery products including bagels, pretzels, buns and fancy baked goods. It is always recommended that products be screened on an ABC Hansen rotary sifter prior to packaging for quality purposes if not for grading or separation purposes.